Jetpur is a city and a municipality in Rajkot district in the Indian state of Gujarat. Jetpur is a textile town in Rajkot District of Gujarat and is situated 30 km north of Junagadh. It is one of the largest centers for screen-printing, block printing and yarn dyeing workshops in the country. 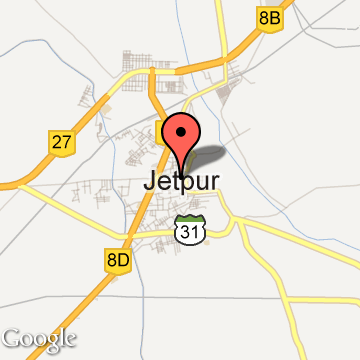 Jetpur is located on National Highway 8D. As of 2001 India census, Jetpur Navagadh had a population of 104,311. Males constitute 53% of the population and females 47%. Jetpur Navagadh has an average literacy rate of 98%, higher than the national average of 59.5%: male literacy is 98%, and female literacy is 97%. In Jetpur Navagadh, 11% of the population is under 6 years of age. The city is famous for cotton saree udyog and is major exporter of khanga and kitange(fabric used by native African for various use). The eminent Politician Shri Jasumatiben Korat was from this town. The city is build-up at riverfront of the BHADAR. the city jetpur is known as the city of Mini Dubai because largest no of cotton printing work is done here. Jetpur is also known as "Capital of Kathiawad". Jetpur Tourism - Get all information on Jetpur tourist places and sightseeing tours. Our website helps you plan your next tour and gives you great ideas on what to do, where to eat, where to stay and when to go there. We give the best information from the web to give you precise, meaningful and useful travel guide for leading places to visit in India and from across the world. Our travel information on JETPUR tourist places, tourist attractions, major sightseeing, the best time to visit, the top places to visit in Jetpur, the must-see things to see and do, maps, restaurants, hotels, nearby tourist destinations, local public information and more. To start with check out information on how to reach Jetpur.